The accompanying photograph is an open-for-inspection view of a soldering aid that has seen factory use for the past four years. The aid has so speeded soldering operations that we simply litter the bench with them so that when ever we reach for solder -- it's there. 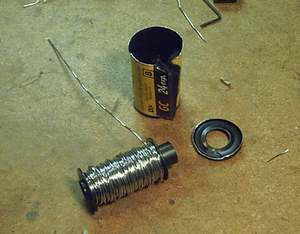 The aid consists of small diameter solder wound on the film spool of a 35-mm. film cassette. 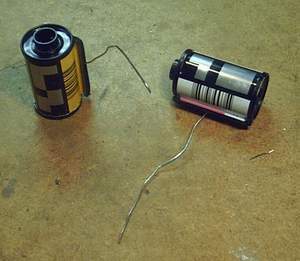 Up to four layers of solder may be wound if a 36-exposure cassette is used. When reassembling the unit, make certain that the solder feeds through the velvet lined slot properly by aligning the slot with the solder lead. Otherwise the solder will not release easily. A small hole is drilled in the spool to hold the starting end for ease of winding. Cassettes may be obtained from some film processing companies at no cost because they are not normally reused after the film is developed. Incidentally, Kester Company puts out an excellent booklet on the subject of soldering. A copy makes good reading for anyone interested in the proper application of solder. This works great for me. It's always so clumsy to hold a full spool of solder (especially the size I buy) when you're trying to do delicate soldering. I also like it because it makes the solder stand up easily for that "third-hand" when you're tinning a wire or component lead before soldering. Ham Tattoos Real tattoos on the bodies of Ham Operators!